Luke Carter is an illustrator and printmaker based in Leipzig, Germany. He's the former art director of STIR magazine and a regular contributor. Here he talks to Megan Dunford about his recent work. Luke Carter: When I was studying my art diploma in college I thought a lot about using art to support social change and this thinking always brought me to illustration. I then started making practice images for articles and books I'd read in college. While I was studying my illustration degree in Bristol I came across this well designed, progressive magazine and thought I would get in touch to see if they needed illustrators. That was Stir Magazine, and the first magazine illustration I ever did! 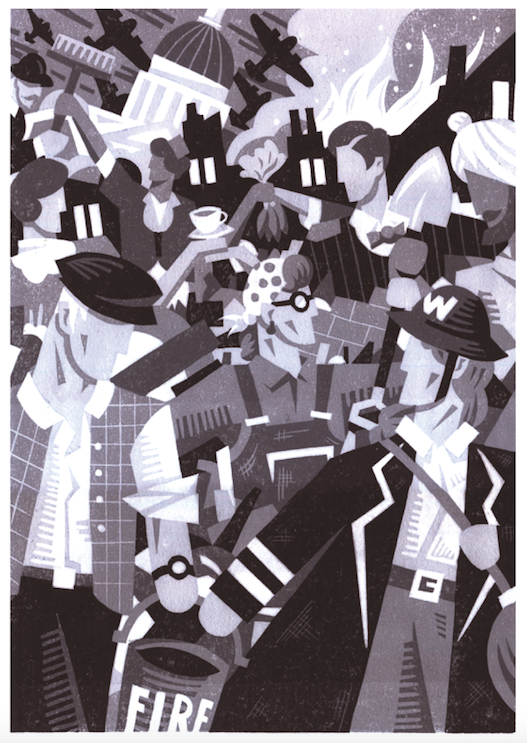 MD: How did you go about thinking up / creating this illustration for the Autumn 2018 edition of STIR for the Rebecca Solnit excerpt's on The Blitz? LC: I went through my usual process which is to read the article a few times over and pick out key words and sentences and scribbling out whatever rudimentary images come into my head. I've been doing a lot of multi-layer linocuts at the moment and decided to use the same technique here going for a greyscale palette to give it a bit of an old-time feel. I wanted to create an image which was somehow tender and playful despite the serious context. I think illustration is often about trying to bring dissonant ideas together. MD: Can you tell us about something you are working on at the moment? LC: I've just finished a project in Speyer in West Germany, where I printed a linocut portrait of Magnus Hirschfeld, the founder of the world's first institute for sexual science in Berlin and a major figure in the LGBT movement in the Weimar Republic and around the world. As I am writing this, I am actually getting ready to visit the UK for two weeks for the first time since moving to Leipzig from Bristol in early 2018. So I'll be having a break from illustration until I get back! MD: What’s the best advice you have ever been given within the context of your work? Phew, thats a big one. I don't think Ive found any one piece of advice particularly helpful. But through friends and reading over the years i've developed some insights which keep me going. A big one is giving yourself a break. Trying to be a 'successful'´creative person is taxing and when you feel you're not succeeding it feels extremely personal. It becomes very easy to knock yourself down through comparisons to other artists. It's important not to forget that illustrators, creative people, are subject to the same social dynamics and inequalities as other people and professions. Some people have very supportive families. Some people are able to live for periods rent free with parents or partners. Some people will not have to worry about having the money for the equipment they need. Some people will know someone with connections in the art world. Not only do these things provide real social and economic privileges, they also help these people to feel more self-confident and secure in what they do — compounding these advantages. I've learned to notice this, and to give myself some credit from time to time, for getting to where I am with what I have. Follow Luke Carter's work here or on Instagram.